The discovery of the element iodine is credited to Bernard Courtois in 1811. He was experimenting with seawater in an attempt to extract sodium carbonate. Through a calculation error, he produced a purple vapor that crystallized into iodine. 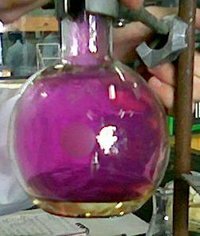 According to information obtained from Wikipedia, the element iodine is derived from the Greek word, odes meaning violet. This is a chemical element that is a single isotope with 74 neutrons. Chemically, iodine is the second least reactive of the halogens and the second most electropositive halogen, trailing behind astatine in both of these categories. However, the element does not occur in the free state in nature. As with all other halogens (members of Group 17 in the periodic table), when freed from its compounds iodine forms diatomic molecules (I2). Iodine and its compounds are primarily used in medicine, photography, and dyes. Iodine is rare in the solar system and Earth's crust. Ultrapure iodine can be prepared by mixing potassium iodide with copper sulfate. The iodides are very soluble in water, and the element is concentrated in seawater. This explain why this element is necessary in trace amounts by all animals and some plants. This heavy element is used by almost all living organisms. Tungsten, a heavier element, is used in enzymes by a few bacteria. Kelp has a high content of iodine element, but is not used as extensively for low iodine treatment because of known pollutants in the water. Today, most of the iodine is now extracted from a mineral compound which contains iodine rather that distilling seawater. The bubble map shows the global distribution of iodine output in 2005 as a percentage of the top producer with Chile producing 15,346 tons. This is a fascinating video from the University of Nothingham in England demonstrating the properties of iodine with a short narrative. Nature's medicine cabinet contains iodine which is used topically such as tincture of iodine. Although iodine is essential for proper nutrition, you should use care when handling it, as it may cause skin irritation and lesions. Property ventilation should be available so not to cause irritation to the eyes and musous membranes. Iodine can be ingested and used topically such as Lugols Iodine when used with care. For those individuals who shy away from the vibrant color, there is white iodine is available.